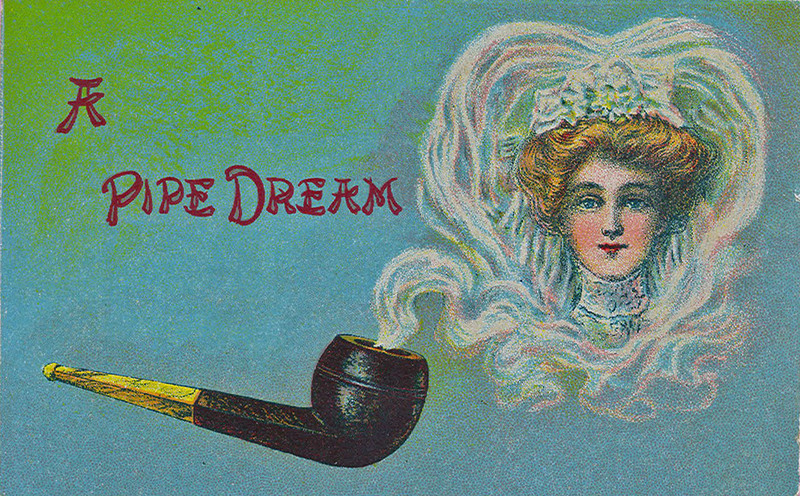 The phrase “pipe dream”, means “a fantastic hope or plan that is generally regarded as being nearly impossible to achieve.” The origin of the phrase is not completely known, but we can trace it back to its first printed example with pretty good certainty. The allusion is to the dreams experienced by smokers of opium pipes. Opiates were widely used by the English literati in the 18th and 19th centuries. Samuel Taylor Coleridge was one of the best known users, and it would be difficult to claim that the imagery in surreal works like Kubla Khan owed nothing to opium. Lewis Carroll, although not known to be an opium user himself, makes clear allusions to drug use in Alice’s Adventures in Wonderland. Sir Arthur Conan Doyle has his hero Sherlock Holmes visit an opium den – although that was for research rather than consumption. The piece goes on to describe an incredible story, apparently believed by the reporter, of a mystic incident in which a man foretells in detail the suicide of another man. It rather makes one wonder what the reporter had been smoking. It seems clear that that Ade would have expected his audience to have prior knowledge of it. He goes to no effort to explain it in the play and the meaning wouldn’t have been clear otherwise. We therefore must assume that it was in at least some wide use in certain regions of the U.S. at that time.